On the second day in Shiraz one of the focal points of travel in a desert country came into focus – gardens. Apparently anything green is considered noteworthy and worth visiting. 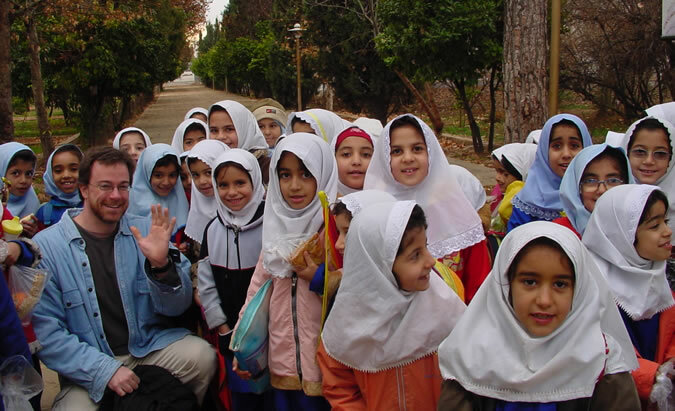 Most were pretty similar, but the one in Shiraz came with something special – school kids on a field trip. More precisely, elementary school girls, all clad in matching headdresses and with some toting spiffy new Pokemon backpacks. Unlike in North Korea, where the teacher had forbidden her students to speak to me, the Iranian teacher had no problem pausing for a few moments so I could talk to the kids and get a couple of pictures. She asked where I was from, seemingly more from curiosity than any desire to censor anyone, and reacted with the typical surprise when I said America. I thought Professor would have to translate but a couple of the girls spoke English surprisingly well and soon had me laughing my way through our short conversation. The friendly experience here couldn’t have been more different from the chill and control exhibited by the North Korean teacher when we met at the Pyongyang circus. The curiosity and excitement of the kids at something new was the same in both countries; it was the attitude of those in charge that set the experiences apart. In North Korea those feelings were to be stamped out, or at the very least, controlled. In Iran they were to be encouraged. As much as I enjoyed talking to the Iranian girls it made me depressed at the missed opportunity in the North, as well as the oppression those children are forced to live under.